Diesel is not the only fuel choice available for off-highway power units, and CNH Industrial has already hinted at what might soon be coming over the horizon following New Holland’s dalliance with bio-methane-powered tractors and truck maker Iveco’s latest power unit launch. James Rickard and Geoff Ashcroft explore the potentials. New Holland is no stranger to alternative fuels, having created a hydrogen-powered concept tractor back in 2009, following this up with a methane-powered project in 2013. The original methane-powered concept saw one of New Holland’s T6.140 tractors adapted to accommodate one of sister firm and engine manufacturer FPT’s four-cylinder, F1C gas-fuelled engine. Already used in vans, the three-litre capacity F1C engine required a chassis to be suspended in and a drop box to reduce shaft speed going into the gearbox, from 3,500rpm to 2,200rpm. The aim of the second prototype was to make the concept more akin to a regular tractor. For this the firm decided to use a larger T6.175 tractor and incorporate a larger FPT, six-cylinder, NEF 6 engine. As a structural engine, it does not require a chassis and can be bolted directly to the tractor’s gearbox, making it much more interchangeable with a diesel engine. Power output is 179hp with 740Nm of torque. The latest version of the concept sees it take on a radical futuristic look, with technology to match. Power and torque levels remain similar to the previous generation, with New Holland claiming durability and service intervals will be on a par with a diesel motor, but be able to achieve up to 30 per cent running cost savings. Noise is also reduced by the use of a methane-powered engine, says the manufacturer, with levels reduced by up to 3dBA. This translates into about a 50 per cent reduction in ‘drive by noise’. Using a composite layered tubular structure, its new sculpted tank design now enables a full day’s work, something which previous concepts struggled with. In real field conditions, the manufacturer claims the tractor produces at least 10 per cent fewer CO2 emissions and reduces overall emissions by 80 per cent compared to a standard diesel tractor. In addition, its environmental performance further improves when fuelled by bio-methane produced from crop residues and waste from farm-grown energy crops, which results in virtually zero CO2 emissions, says New Holland. With several phases of testing still to go, the methane-powered concept could be commercially available within five years, says the manufacturer. Taking inspiration from automotive design, CNH Industrial’s design team reimagined tractor styling to create a fully integrated body look. Wrap-around glazing provides 360-degree visibility, with a 20 per cent increase in glazed area compared to a standard tractor. Its glass domed roof with New Holland’s fully integrated Precision Land Management receiver provides panoramic views, offering extra visibility for loader work. The interior of the cab has been designed to offer a clutter-free environment, with all primary controls located on the integrated armrest and additional parameters controlled through the interactive headliner display. Further tractor information can be displayed through the steering wheel-mounted screen. How far can gas power go? In the truck world, FPT has also developed a gas-powered engine for fellow CNH Industrial brand Iveco. Based on a FPT 13-litre, Curser 13 engine, the same block as used in the likes of Case IH’s Quadtrac tractor and New Holland’s FR forager, the concept hints as to what might be over the hill for both agricultural and commercial vehicles. 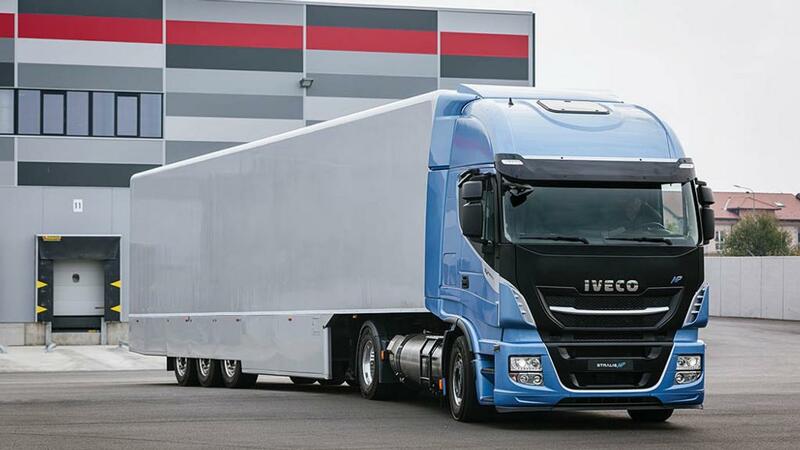 A Cursor 13 natural power (NP) engine was recently shown off powering a 40 tonne Iveco Stralis articulated truck. Producing 460hp, it uses spark ignition technology and operates just like a petrol engine. As a result of lower compression, it is much quieter than its diesel counterpart. FPT claims it is a direct match for the 460hp diesel Cursor 13 engine, and the NP version brings much lower running costs, simpler maintenance and near zero emissions from using liquefied natural gas (LNG) or compressed natural gas (CNG) as its fuel, it says. However, there are challenges for truck operators concerning the accessibility of the two fuels, and the practicality of storing fuel on-site. LNG is cryogenic and its minus 160degC liquefied state requires storage within insulated tanks at nine bar pressure. CNG on the other hand is stored in high pressure vessels from 20 to 200 bar. However, for farms producing their own bio-methane (CND) via an anaerobic digestion plant, it could prove to be a self-sustainable match made in heaven. For instance, all the machinery could potentially be methane-powered. Significantly, because both LNG and CNG both burn cleaner than diesel, NP engines require very few emission after treatments such as costly and cumbersome diesel particulate filters, diesel oxidation catalysts, exhaust gas recirculation or selective catalytic reduction. This dramatically simplifies the engine and its maintenance, says the manufacturer. The only external addition to the engine is a three-way exhaust catalyst, similar to that found on a petrol engine, to deal with carbon monoxide produced from the fuel burn. Operating temperatures are typically 30 per cent higher than a diesel engine, so FPT has given the Cursor 13 NP a new cylinder head constructed of graphite iron to help valve and valve seat lubricity. It also gains a revised exhaust manifold and turbocharger – the latter getting ball bearings and a water-cooled core. The NP engine also uses multi-point fuel injection, feeding gas directly into each cylinder, on the back of the intake valve, which overcomes the difficulty of fuel/air mixing with single-point fuel injection systems. In terms of power output, the Cursor 13 NP provides 460hp from 1,600-1,950rpm, and a peak torque figure of 2,000Nm from 1,100-1,600rpm, with 1,750Nm available from 1,000rpm. By comparison, the Cursor 13 diesel packs a peak torque figure of 2,200Nm and it extends lower down the range too, for greater start-up torque. It offers 2,000Nm from just 900rpm. FPT has already had a lot of success with the smaller capacity, and lower powered Cursor 9 NP engine and the arrival of the 13-litre has finally made gas-powered engines a viable alternative to diesels, it says.